He says it's "unfair" to ask him whether he'd consider pardoning his indicted pal. Maybe it isn't fair to hang Rudy Giuliani with all of the sins of Bernard Kerik, who surrendered to law enforcement officials this morning after being indicted by a federal grand jury on charges of mail and wire fraud, tax fraud, making false statements on a bank application, making false statements for a U.S. government position and theft of honest services. Yeah, so maybe Giuliani's "loyalty" to Kerik caused him to miss the "warning signs" he was shown. And yeah, maybe Giuliani has changed his story about what he knew about Kerik when. But Giuliani has sort of admitted that he erred in not vetting Kerik more thoroughly before naming him police commissioner in New York and pushing George W. Bush to nominate him as the director of the Department of Homeland Security. And yeah, so maybe Giuliani has also made it clear that he thinks his appointment of Kerik was, on balance, the right decision anyway -- he got results, you know? --- but that's all ancient history. After all, Giuliani appointed Kerik police commissioner in 2000, which was a whole year before 9/11, which is when everything changed, right? 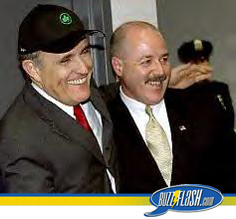 But now that we're living in a post-9/11 world and Giuliani is running for president, wouldn't it be appropriate to ask whether Giuliani would recuse himself from any involvement in Kerik's case? Apparently not. The New York Daily News asked Guiliani Thursday whether he'd consider pardoning Kerik if he's elected and Kerik's convicted. Giuliani's answer: "It wouldn't be fair to ask that question at this point."